More than $280 million in federal gas tax that is supposed to flow to TransLink is sitting unused and Metro Vancouver politicians now want some of it to go to building bike lanes. Since 2005, Ottawa has handed back to TransLink at least half of the 10 cents a litre of gas tax it collects within the Metro region and the money has helped finance hundreds of new and replacement buses and SkyTrain cars. But TransLink is only allowed to spend the resulting fund on certain types of projects – mainly vehicles – and with its capital spending constrained, the transferred federal gas tax money is stacking up faster than it can be spent. An extra $122 million will flow in this year, lifting the total to more than $400 million. 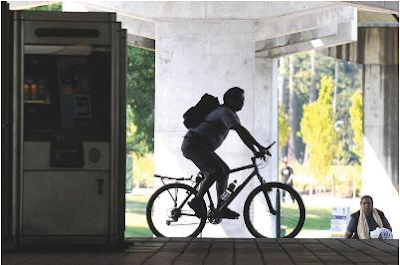 "We want to be able to spend that money reducing our carbon footprints with cycling infrastructure around the region," Burnaby Mayor Derek Corrigan said. But the federal government two years ago removed bike-related projects as an allowed use of the gas tax transfers. Metro's regional planning committee voted Friday to urge area cities to lobby Ottawa to reinstate that use. "It's more consistent with the green agenda for the gas tax dollars," Corrigan said. TransLink strategic planning and public affairs vice-president Bob Paddon said it was unfortunate the federal government disallowed cycling spending. But he rejected suggestions the gas tax money will go to waste, noting it is carried over each year and TransLink has more eligible spending in the works. This year TransLink is applying to use $123 million from the fund to replace hundreds of older buses, community shuttles and HandyDarts over the next three years. The federal gas tax transfer is separate from the 17 cents a litre in tax that TransLink directly levies on each litre of fuel sold in Metro Vancouver. TransLink's currently proposed three-year base plan would pare back the amount of money going to cycling upgrades around the region.